Claire's passion for crafting compelling visuals for nonprofits makes her an ideal fit at Big Duck. Claire has been designing for nonprofit organizations since graduating from the Cooper Union for the Advancement of Science and Art in 2007. She jumped into the nonprofit community designing materials for The Public Theater and Shakespeare in the Park (which came with the added perk of experiencing New York's theater scene). 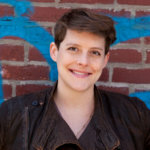 Claire then moved across the East River to Brooklyn Botanic Garden, where she settled in for four years and guided them visually through a capital campaign and a rebrand effort (learning a few Latin botanical terms to boot). Her most recent pre-Big Duck adventure was to strike out solo, working as an independent art director for nonprofit clients such as Urban Green Council, the San Francisco Botanic Garden, and Idealist. When not in front of a screen, Claire is busy taking care of her many dependents, who include a dog, a 20-year-old cranky parrot, and two children. Type hierarchy on MTA subway ads and idling cars in bike lanes. Travel tips for the American West and the most fun playgrounds in New York. Here’s an exercise you can do with staff or solo to look at your organization’s sub-brands, events, and initiatives with new eyes—the eyes of your audiences.